We all know that alcohol negatively affects cycling performance. It increases the risk of accident by slowing reaction time and impeding agility. It has a dehydrating effect that can cause muscles to cramp. And it leaves the cyclist feeling sluggish and impervious to pain. This is the life! 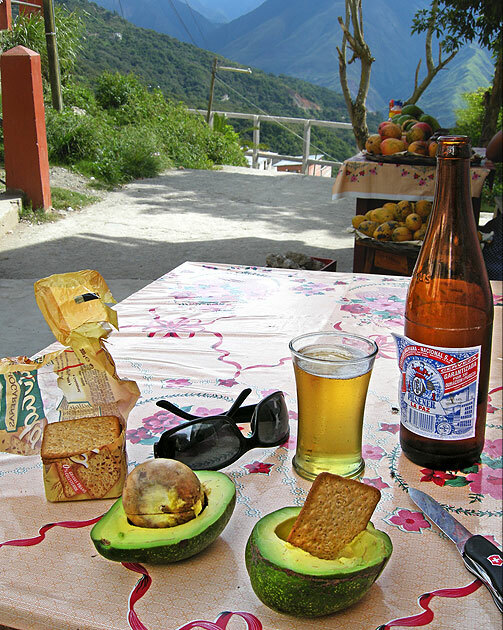 Taking a midday beer break from the heat and rough roads in Coroico, Bolivia. So, we shouldn’t drink and tour, right? So, can we drink and tour, or not? Well, the accepted wisdom is that it’s bad to mix alcohol with cycling and I don’t disagree. 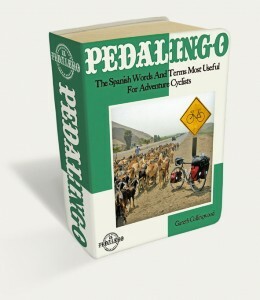 But then cycling and adventure cycling aren’t exactly the same thing. 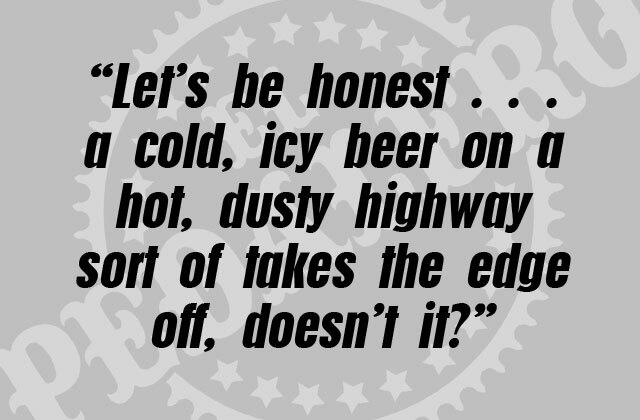 Let’s be honest; a cold, icy beer on a hot, dusty highway sort of takes the edge off, doesn’t it? You seasoned adventure cyclists know what I’m talking about. Obviously, there are times you should never drink and ride. 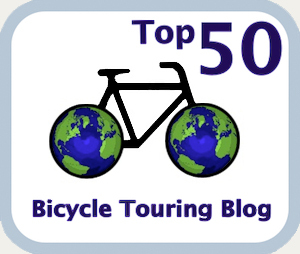 Busy highways, high altitudes, cliff-side roads, city streets, big climbs, and fast descents are not places to be riding under the influence of anything other than common sense. Sometimes, you don’t need to ride on high alert. Sometimes, you’re stuck on the same drab desert highway for weeks. Your morale erodes and you thirst for something more refreshing than the hot, sloshing liquid in your water bottles. Then, when the midday sun is at its meanest, you see a lonely roadside cervecería. 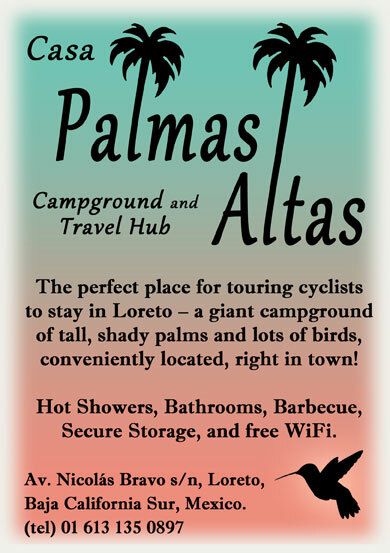 Now, you pass the hottest hours of the day sipping cerveza, bien fría, and chatting with friendly truckers and locals. When you get back on the bike it’s a whole different feeling. This highway’s not so bad after all, you think, as you roll along with a buzz and grin. I’ve been stuck in beer traps more times than I can remember. That’s to say, not often – I just can’t remember them. Memories of beer traps are a little foggy. You stop by a corner store to get some supplies. Three or four locals sit outside the front door drinking beer. You accidentally lock eyes with them. Immediately, they invite you to join them for a beer. You smile and say, “no, gracias,” but they insist. “Bueno, una cerveza,” you concede, and sit down for one beer, just one. But before you’re halfway through that first beer, they’ve already opened a second beer and put it in your free hand. And before you’re halfway through that one, they’ve pulled the trick again with a third beer. Then a fourth. On it goes until – eight beers later, and after spending the entire afternoon with these guys, singing and yelling – you finally summon the strength to stagger away. Now, if only you could remember what you came to the store to buy. While beer traps can snare you anywhere in Latin America, the beer cage is, as far as I know, a purely Cuban phenomenon. It begins when you hear a crowd roaring in the distance. You follow the din to a park, in the middle of which stands a makeshift wooden cage. 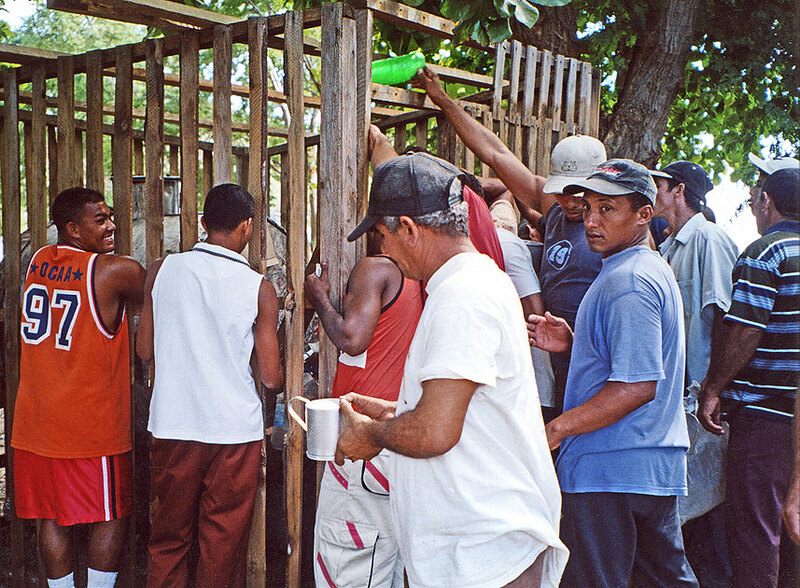 Dozens of men swarm around the cage, pressing inward and holding up empty containers of every kind (plastic bottles, glass jars, cereal bowls, anything). Inside the cage are two men. One man collects cash and containers from individuals. The other fills the containers from an enormous vat of beer. Crapulence abounds – laughing, yelling, staggering, singing, and general partying. Bodies passed-out on benches and under bushes. I admit I once participated in this mêlée in the small town of Chivirico, west of Santiago. With the help of a local inebriate who knew how to push through the crowd, I had both my bike bottles filled with surprisingly un-skunky beer for about fifty cents (that’s a shot of me drinking said beer at the top of this article). The Beer Cage. Grab a receptacle of any kind, push to the front, and yell! So, what (if anything) have we learned about biking and boozing? Well, it’s not really good for you, but it’s also not that bad. In some places, it’s safe to drink and ride, but in other places it’s not. Be wary of beer traps and beer cages, but don’t be paranoid; participate only if you feel good about the situation. As they say, pa’rriba, pa’bajo, pa’l centro, ¡pa’dentro! For a closer look at these Latin American beer labels, visit the complete gallery. Rum (Caribbean) – used in: daiquirí, Cuba libre, mojito. Feature image (top of page): After surviving the “beer cage,” I find a shady spot to drink the rewards. Chivirico, Cuba. Spot on. Relax and have a little drink. When I was in Spain the “menu del dia” often included wine in the price. What am I to do? Sit back and enjoy. Conversations at bars are a precious part of an adventure. There’s always time to sit back and enjoy a swig and a chat when you’re on the road. Thanks for stopping by El Pedalero! Haha I remember that day so well! :) that beer was really good. Didn’t we have a nap on those benches? Did we “nap” or did we simply “pass out” – I can’t remember. I do remember trying to bike drunk up that hill out of town though! Good times. Thank you for having this site. It gives me so much pleasure to see the photos and to read your articles/ stories. There are so many good memories!